Here’s a good take on that question. Posted on September 17, 2015 Categories UncategorizedLeave a comment on Should Designers Learn to code? If you haven’t heard Swift is a new language from Apple. Swift aims to be a modern language that streamlines your work. Swift is strongly typed. This means that every value in Swift must be assigned a type. Here you have a single name, x, representing a single value the number (Int) 230. A Struct is the same, with the difference that a Struct is a structure containing more than a single value. You can think of the difference conceptually as the difference between: nail, and house. Nail is a single discrete element, while a house is single structure, it contains many sub elements. Structs can also contain functions. In many ways a Struct is similar to a class. From our perspective they act in very much the same ways. Internally the software works them. Structs are assigned as values and Objects created from a Class are assigned as reference. Structs are always copied when they are assigned. Class Objects are not copied when they assigned. var address = "123 Maple St."
b.address = "321 Elm St."
println(a.address) // prints 123 Maple St.
println(b.address) // prints 321 Elm St. Here you have two separate Houses. The first (a) would have the address 123, the second would have the address 321.
var address = "123 Maple St"
println(a.address) // prints 321 Elm St.
You have two references to the same house, which moved from it’s original address to the 321 address. In Swift everything has a type. And these types can be fairly detailed. For example, Swift makes a clear distinction between a single Character, and a Collection of Characters. A Character in Swift can be any Character, this includes Emoji characters, and any other special character from any language set. You aren’t limited to UTF-8 characters. Characters also have a Name which describes the Character. For example a might be LATIN-SMALL LETTER A, while an Emoji might be FRONT-FACING BABY CHICK. A String is a collection of Characters. The String has methods that allow us to access each Character in the String, and modify those Characters. Often when programming you keep track of fixed sets of things. These could be choices like how you will view something, for example Year, Month, Week, or Day. Other sets might be related to the capabilities of your app like the orientation: Portrait, Landscape. Or it could be a list enemy or character types a game might create. Another example might be the colors of tags that an app might use to organize elements. There is also a problem in that your tag colors might be fixed, the Array provides many methods that allow the list to be modified. While you can work around many of these things, there is also ready made construct for this purpose the Enum. Enum or Enumeration is similar to a Struct though more limited. Enums provide a system for creating variables that have very specifically defined values. Use an enum when you want to ensure that a predefined set of values are used. For example, imagine your program wants to set the colors of some tags. The colors are predefined as: Red, Orange, Yellow Green, Blue, and Purple, an Enum provides a perfect way to keep these organized, while also making your code more organized and easier to work with. Names like Red, and Green work well in code. Writing the actual color in code is difficult to work with. Just looking at this it’s really hard to tell Yellow: #e7d936 from Green: #39b54a. That’s a lot to write. If it were used more than once in our program, and it probably will be, there will be a lot of code for us to write, which translates into more chances for errors, and difficulty in making changes. You might also want the Hex value: #b32f3c, at another point, and the color name: Red at another time. You might want to display a table cell, set the background to the color, with UIColor(), you may also want to display the tag name: Red on the right side. Both of these items are tied together and related. To work with them in code we want the same type of relationship. We want to talk about Red, and have that mean the UIColor(), and the name, and anything else associated with Red. An Enum is a programming structure in Swift that is made for exactly this. 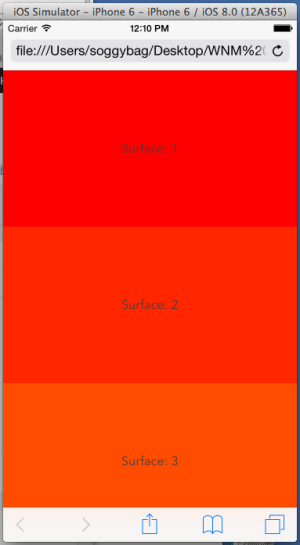 Any variable can now hold a reference to one of the colors. Now you have to assign this item a TagColor. Here are all of the things above in a playground. Here are some thoughts on HTML5 and whether it’s up to the task of making mobile apps. After reading this I had to ask. Is a web browser with multimedia capabilities really the platform to deliver full feature mobile applications? But adopting HTML5 for mobile apps isn’t a panacea, as reflected in Forrester’s findings. In fact, one of the report’s survey responses noted that 59 percent of the time, apps developed solely using HTML5 took longer to deliver than planned. With non-native responsive frameworks, the greatest amount of time was lost testing and fixing issues. The survey of developers says 59% of the time HTML5 apps took longer to develop.That flies in the face what people have been touting as common wisdom for the last few years. It seems to fit with my limited personal experience. This survey from 2012 says an overwhelming percentage of developers are planning to use HTML5 to build their apps. Their top reason: familiarity with the languages HTML/CSS/JS. I have to ask is that the right reasoning? Admittedly the second most popular reason was cross platform compatibility. You can only imagine that wanting building apps in HTML5 since it is more familiar means that these people do not want to spend time learning a native development tool, and they thought it would be faster and easier. In the article above, from 2014, two years later, shows that a majority of developers agree that it took longer to develop their apps in HTML5. I can imagine that a fair amount of apps took just as long it would have taken to develop native. A few may have been developed faster. But for the majority it was longer or about the same, to develop an app that will lower performance than a native app. Again here they show 90% of developers using HTML5. I work with students developing apps, and many students want to use HTML5. Many for the reasons popular in the article above, ease and familiarity. I would say a majority of the projects are social media. Notice the chart here labeled types of apps. The most popular app is productivity at 54%, social media apps is 18%. You could say that social there are fewer people developing social media, and that may be true, it’s hard to say from this chart. Look at games only 8%. Games have to be in the top three for shear volume in apps. Social media apps are also very popular. Looking at the chart in this light, you might start to think that people are choosing native for games and social media. Obviously you can’t make a definitive conclusion like this from this information, but it does hint that there is more to this than the 90% figure. Targeting multiple platforms with native is native’s biggest disadvantage. I went out on a limb earlier and said that native apps had better performance. What does that mean? I think this is a good point. Developing an app faster (or may be not faster) for less, is this a good thing when the user experience is poor? Did you really save time and money? Was your time and money well spent? Maybe not. From a user perspective native is better. From a developer perspective HTML5 seems to be preferred. Think about that for a moment. Is this the cart driving the horse? shouldn’t a developer want to produce the app that will provide the best experience and performance for a user? Seems like there is little advantage in choosing to develop an app in HTML5 because you are familiar with it, rather than it is the best tool for the job. But wait, there’s more. Here’s another. This was the lowest level since Appcelerator began tracking the specification in April 2011. “Interest in HTML5 peaked in July 2012 at 72.7 percent and has shown and uneven but downward slope since,” the report said. I think this is referring to the same survey that showed HTML5 down to 59%. They mention a downward trend. There isn’t a chart or reference to this, which is too bad. It should be noted, that the survey mentioned here is from Appcelerator, which is a JS based pseudo native app development tool. In the battle between HTML5 and native apps, HTML5 is starting to become a strong contender. While native app approaches have been a top choice in the past, a recent survey revealed that 57% of participants believe HTML5 is enterprise-ready, or will be in within the next year. Seems the real advantage to HTML5 for mobile apps is, that it is faster and easier to develop. Keep in mind that the earlier survey said 59% of developers thought it took longer to develop in HTML. Users also prefer native. In this light the advantages of HTML5 seem very slim to nonexistent. Why post this? I don’t have an axe to grind, but I do feel there is a lot of hype in HTML5 these days. And it’s easy to see it as a good fit for everything. I feel this approach is not the correct approach. Without applying an honest critique to what is happening in the real world you run the risk of choosing a tool that is not the best fit the job. Which leaves you with a poorly performing product and more hassle than necessary. I believe there is a class of app that works well with HTML5, but it’s a small subset of all of the apps you could make. I also believe that the margin in development effort between native HTML5 much slimmer than what most people would suggest, and possibly nonexistent. If there is an advantage to HTML5, it’s in distribution.